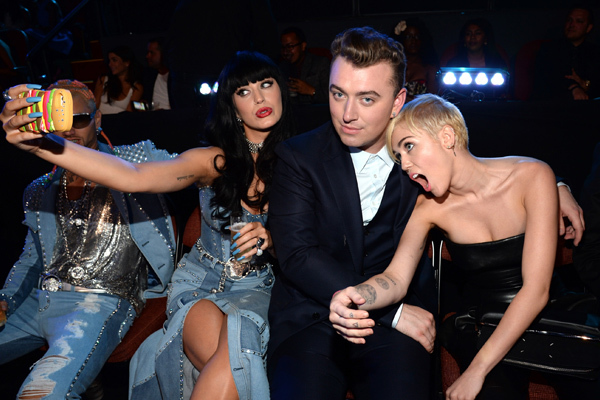 In today’s celebrity BFF news: Miley Cyrus says Katy Perry is her oldest friend in Hollywood. Who knew? On Tuesday, Cyrus stopped by New York radio station WKTU to chat with Cubby and Carolina Bermudez about her new single, “Malibu.” Although “Malibu” is currently competing with Perry’s “Bon Appétit” in the music charts, the singers themselves have a more collaborative relationship. The two pop stars have been friends since 2008, and according to Cyrus, “that’s like a really long time” in Los Angeles. 10 years of a friendship is a really long time in any city, but in Hollywood, it’s basically forever. “When she came out with ‘I Kissed a Girl,’ I was doing the Hannah Montana movie, and I heard her on the radio. They said, ‘Who did you write that about?’ She said me!” Cyrus recalled. The best part about this friendship, however — at least in our opinion — is that you can actually see it in red carpet pictures. Take a look back at Cyrus and Perry’s evolving friendship below, beginning back in 2008. The “I Kissed a Girl” singer posed with her new BFF and Hannah Montana alum at the MTV Video Music Awards in September 2008. Can you believe how young they both look? At the 2009 Grammy Awards, Cyrus and Perry hung out with Taylor Swift and Kelly Clarkson. Talk about a throwback picture! These two singers can’t stay away from one another when it comes to the Grammy Awards. Oh, and we love that they always make goofy faces when they are reunited. Friends who selfie together, stay together, clearly. The Voice coach threw up a peace sign at The Daily Front Row Fashion Awards Show alongside her longtime friend and Nicole Richie. Of course, this duo posed together at the 2015 Grammy Awards in Los Angeles as well. As always, they kept it real and couldn’t stop laughing together. We just love this friendship and look forward to seeing it continue to grow!